Please use the form below to explore how an enhanced operating team can be commercially focussed around pro-active and natural sales and a positive guest experience. This form focusses on driving overlay business on top of hat you already sell. 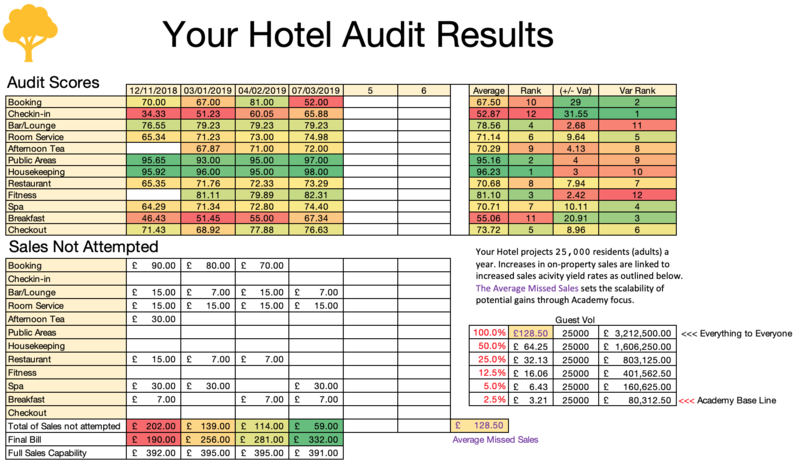 When you’ve moved your Ops Playbook from files in the office to your online Hotel Academy change can happen! To achieve an accurate on-property sales starting point strip out any revenue that is booked off-property e.g. Rooms (but not upgrades at reception). When you’ve reached a solid on-property figure you can begin to link your L&D to your future revenue forecasts – because sales don’t just happen by themselves. Working on an active 15 hour sales day.